But WedMD Says it’s Cancer! The 1st Rule of Fight Club is: Nobody talks about fight club. 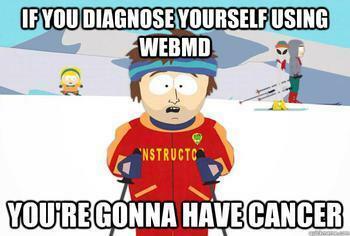 The 1st Rule of Internet Health Research is: WebMD will make you think something is gravely wrong with you. Let’s have fun with some much less scary diagnostics. Many people with back pain don’t realize that back pain is VERY prevalent. It is one of the most common and most costly conditions. It is usually, but not always, a non-emergency situation. Rarely is back pain something you need to get x-rays and MRI’s for, or something you need to lose sleep over because you think your back pain is indicative of some type of underlying back cancer. -“Saddle anesthesia”, which is numbness or tingling in the groin area. This may indicate cauda equina syndrome, which requires immediate medical attention. While cauda equina syndrome is a big deal, other things which aren’t so alarming that also cause numbness and tingling include sciatica and piriformis syndrome. These less scary alternatives will have the numbness or tingling in the leg or buttocks rather than the groin. -Difficulty with urinating, such as the inability to urinate at will or the inability to not urinate. These are also indicative of cauda equina syndrome and should be attended to immediately. -Deep, “boring” pain that feels like it is in your bones. Most back pain does not feel like it is from deep within the body. If you have deep pain that feels like it is from within the bones and causes intense yet diffuse pain that is different than other types of pain you have experienced, this deserves the attention of x-rays or an MRI of the area. Other worrisome features of back pain include pain that literally wakes you up at night or that causes night sweats, and pain that is not alleviated at all by common painkillers. Now, when I say pain that wakes you up at night I do not mean that rolling over in bed tweaks your back and you wake up for a moment. I am referring to pain so intense that you are awoken from the pain itself. If you wake up and find yourself sweating and cold, this is cause for concern. -Low back pain that comes and goes and fails to respond to conservative care, specifically in a male approximately 50 years of age who has difficulty urinating. This may indicate a prostate issue that would require a visit to your Primary MD to have a PSA test or digital exam. Fun, fun. Now that the scary stuff is done, how about the less scary stuff? -Vertebral subluxation – when the bones of the spine lose proper juxtaposition to one another and irritate nearby nerve roots, causing bodily dysfunction. Chiropractors adjust subluxations all day long. -Sciatica – irritation of the sciatic nerve causing pain, numbness or tingling in the leg. Often a disc is herniated or bulged. At Park Bench Chiropractic we eat sciatica for breakfast. -Piriformis syndrome – when the piriformis muscle, sacroiliac joint, and sciatic nerve team up on you to cause pain similar to sciatica. We will adjust the sacrum and lumbar spine and mash and stretch that piriformis muscle into submission. There are literally a dozen more causes of back pain, at least. If you want to chat with us about it then give us a call and set up a consult. We love talking about the spine and chiropractic. Really. You’re bent to the side, huh? I Feel So Great After Being Adjusted…How Does it Work?